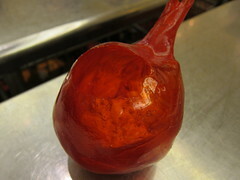 This past weekend, I had the unique opportunity to attend a Papabubble candy-making workshop at Ojai Valley Inn & Spa. After doing some online research, I learned that the only Papabubble shop in the U.S. is in New York City – Little Italy, to be exact – so I couldn’t wait to see the demonstration. Maybe the West Coast would finally get a taste of these hard goods. When my girlfriend and I first arrived in Ojai, we couldn’t imagine a more beautiful setting within which to learn about candy. Apparently, Ojai Valley Inn is making a push to host chef-centered, educational programs for the public – something I can definitely get behind and am honored to have been a part of, for at least one event! So after we checked in to our posh room with a fireplace, we headed over to the workshop where desserts by Pastry Chef Salvatore Marcone met us – complete with coffees, teas and real hot cocoa (as in, melted chocolate). I would be remiss if I didn’t rave about how excellent these all were, including mini creme brulÃ©es dipped in white chocolate, lavender cheesecakes and gold flake-topped chocolate domes. 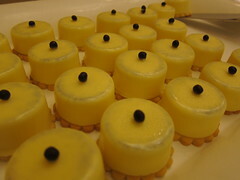 And I can’t forget the lemon meringue tarts – with probably the best lemon meringue I’ve ever had in my life. Papabubble is handmade hard candy which is made through a very time-sensitive process beginning with pots of liquified sugar. I was delighted by the story of Chris and Rachel Grassi, two artists from New Mexico who co-own the American flagship in New York City, and the discovery of their love for candy-making while on an extended trek through Europe together. They learned from friends in Barcelona, and decided to bring the traditional European craft Stateside since they figured they “had to go home, eventually.” New York proved most conducive to their business plan and product, and today their Little Italy storefront hosts a most eclectic gathering of spectators intrigued by the sight of candy being made by hand. When we arrived in the hotel banquet hall, we couldn’t see the extreme boiling action going on in the kitchen next door. When the pots were finally brought out, though, they went straight to a heated marble slab. Chris and Rachel then started spreading the melted sugar evenly across the slab while using metal bars to knead the sheets as they became thicker while cooling down. And then when it was solidified, the “clay” was transferred to a heated rubber mat to undergo continued stretching. 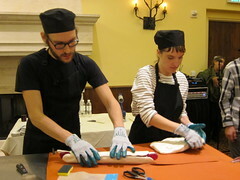 Chris and Rachel continued to stretch and fold the warm putty repeatedly with respect to their separate colored shares. And then the molding began. Eventually, it was Chris who ended up with one long, baseball bat-shaped piece of putty candy he kept rolling back and forth while pulling on the skinny end. 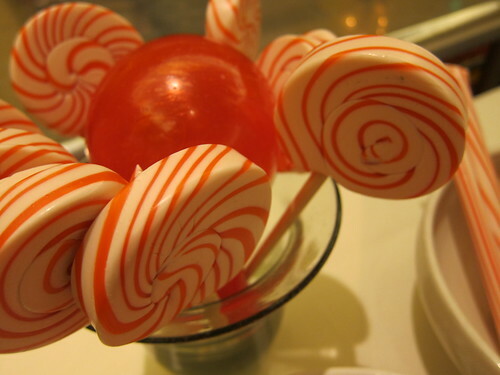 It is from this skinny end that rolls of lollipops are formed inside round metal rings. Ultra-skinny rolls are used to make small candies by chipping pieces off the sticks after they’ve been rolled and hardened. And as for where the name “Papabubble” came from, we were told one of ChrisÂ and Rachel’s friends liked to blow bubbles into remainder candy putty for fun…and the name stuck. At the end, we were each treated to a goodie bag of Papabubble candies. One jar of herbal flavors was actually custom-made for our event in Ojai, with the city even being spelled inside the roll of each candy! (By the way – I have tried everything and though their chocolate-filled lavender candy tastes a bit like soap, their fruit and herbal varieties are all very delicious!) They have standing lollipop orders with Tiffany’s outposts in New York made with extra-specialÂ “Tiffany blue.” You can also find Papabubble at Dean & DeLuca, Bergdorf Goodman and other high-end retailers. 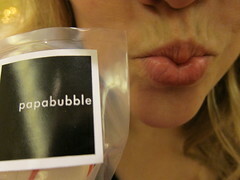 Now…which high-end, Los Angeles outpost will be the first to carry Papabubble candies?! Joan’s on Third? Hello? 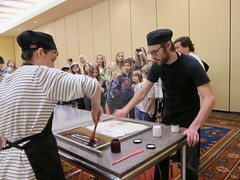 Papabubble workshop fee, dinner at Maravilla (post to come soon), breakfast buffetÂ and one-night’s stay at Ojai Valley Inn & Spa were all hosted. 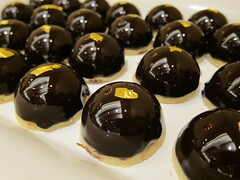 This entry was posted in Events, Food, Travel and tagged candy, candy making, Chris Grassi, hard candy, Little Italy, New York City, Ojai, Ojai Valley Inn & Spa, Papabubble, pastry chef, Rachel Grassi, Salvatore Marcone, workshop. Bookmark the permalink.